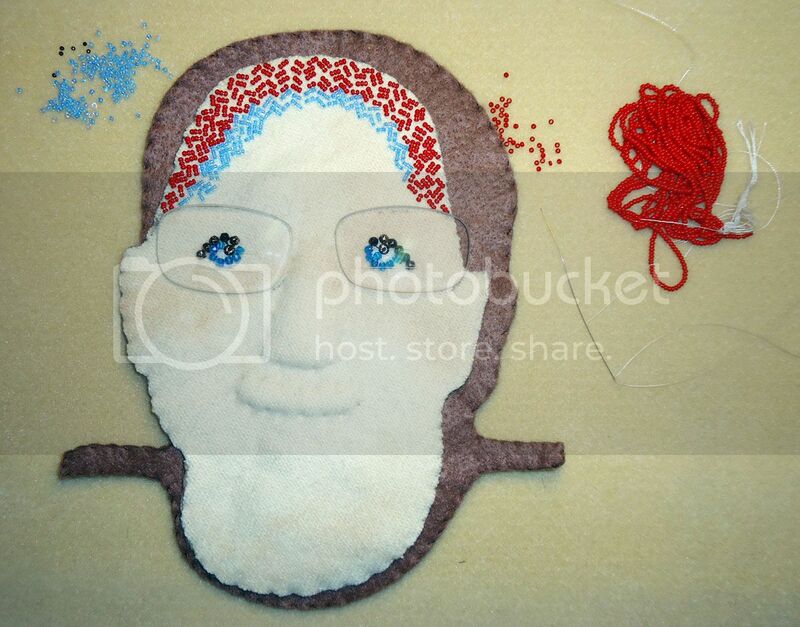 Dear friends, I have been making a little progress on my beaded house portrait. 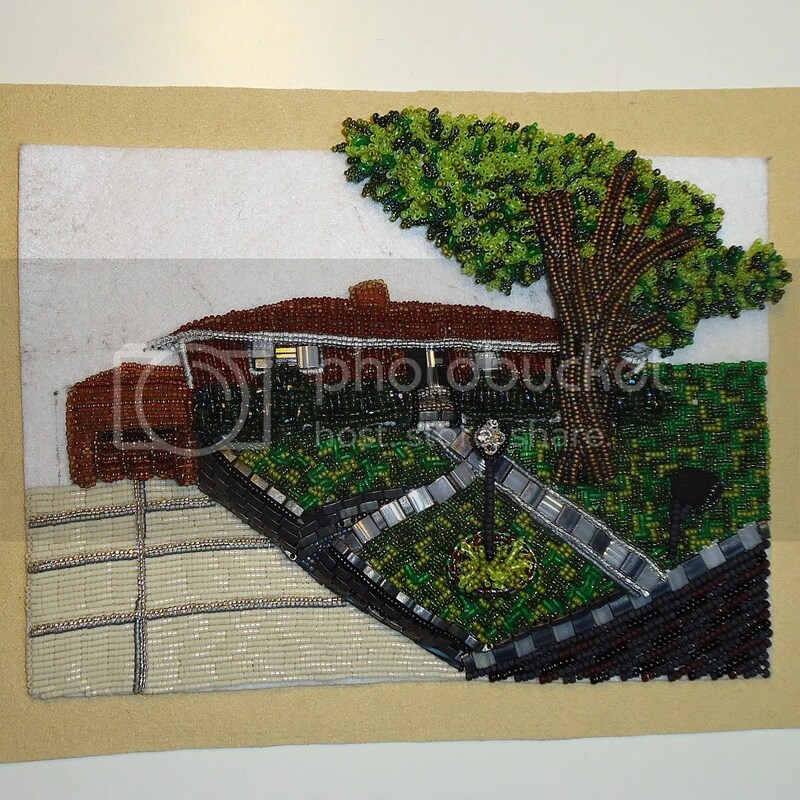 Check it out..
First, I have stitched Miyuki Tila and half-Tila beads for the sidewalk and the wall near the driveway. Then, I created a tiny mailbox and yard light by stringing beads onto eye pins and attaching them at the back of the piece. I used Preciosa rose montee rhinestones for the yard light. It really sparkles! Next, I began working on the large tree. 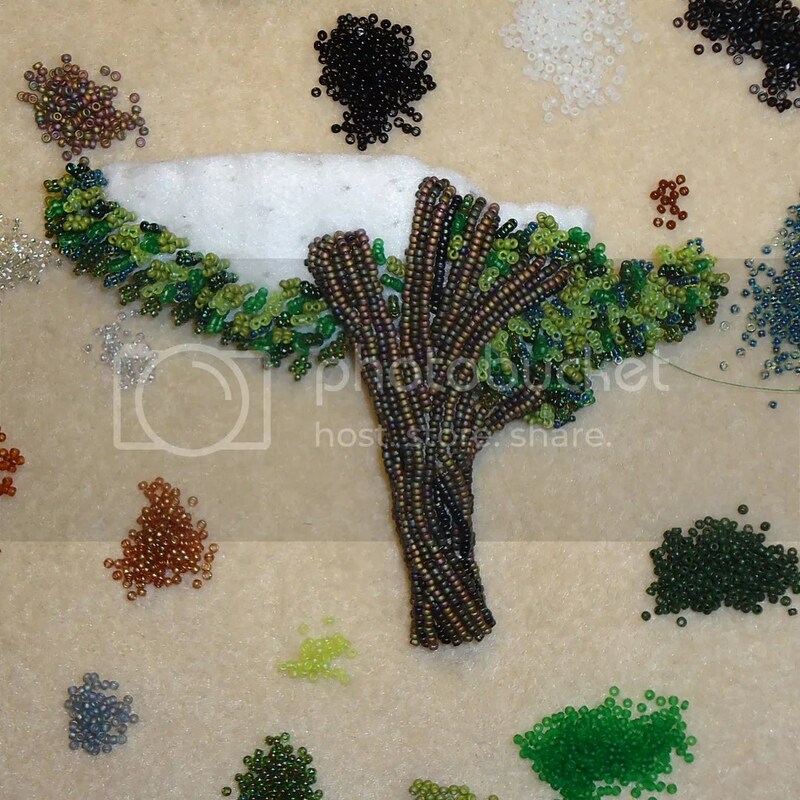 Tiny glass seed beads make it look larger than it really is! 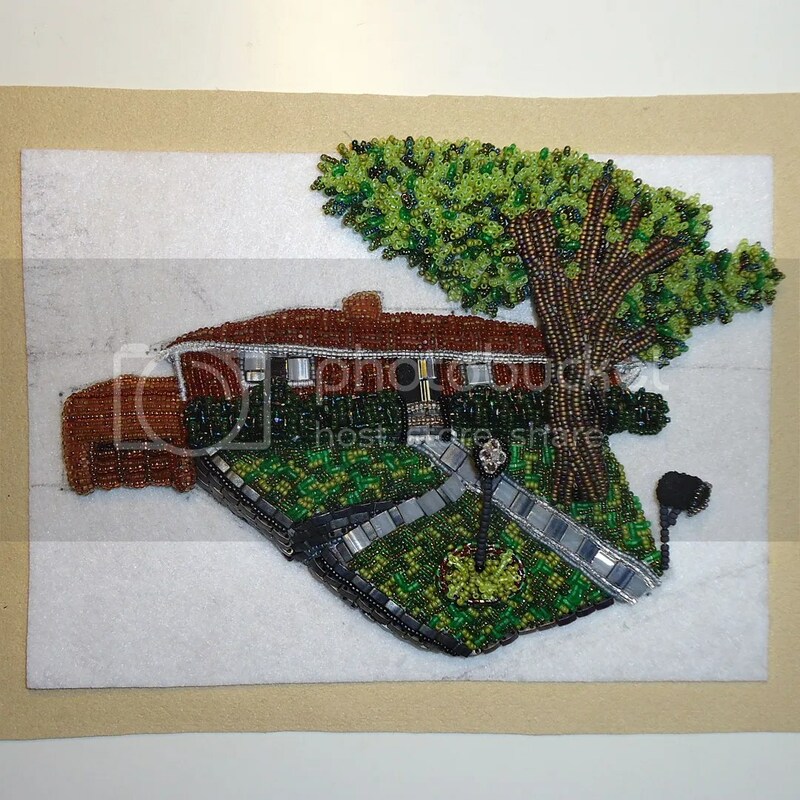 In the photo above, I began beading the grass. 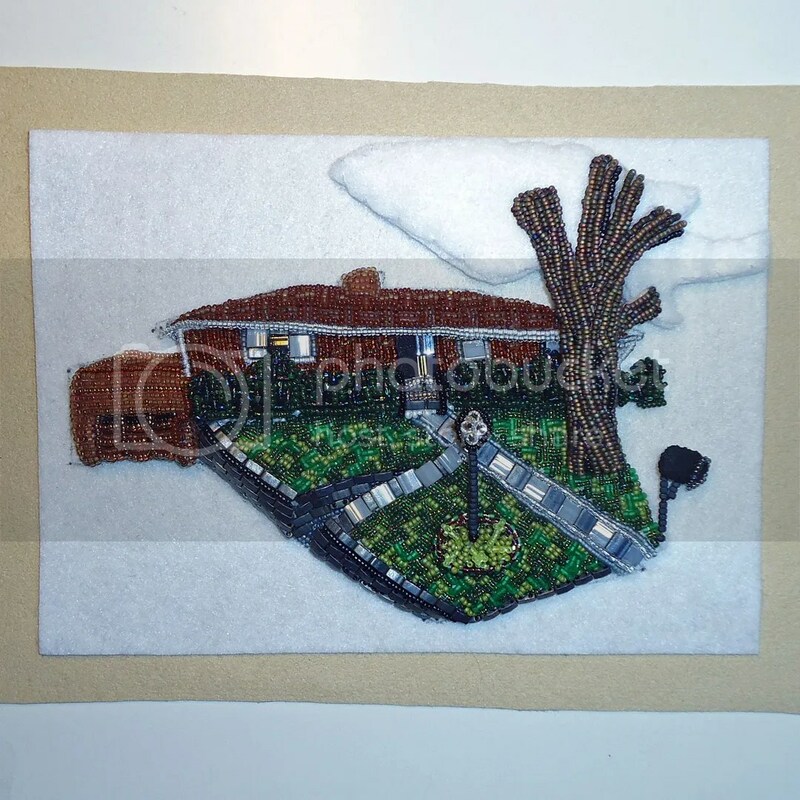 Stitching in several directions, I used 4 different shades of green for visual interest. 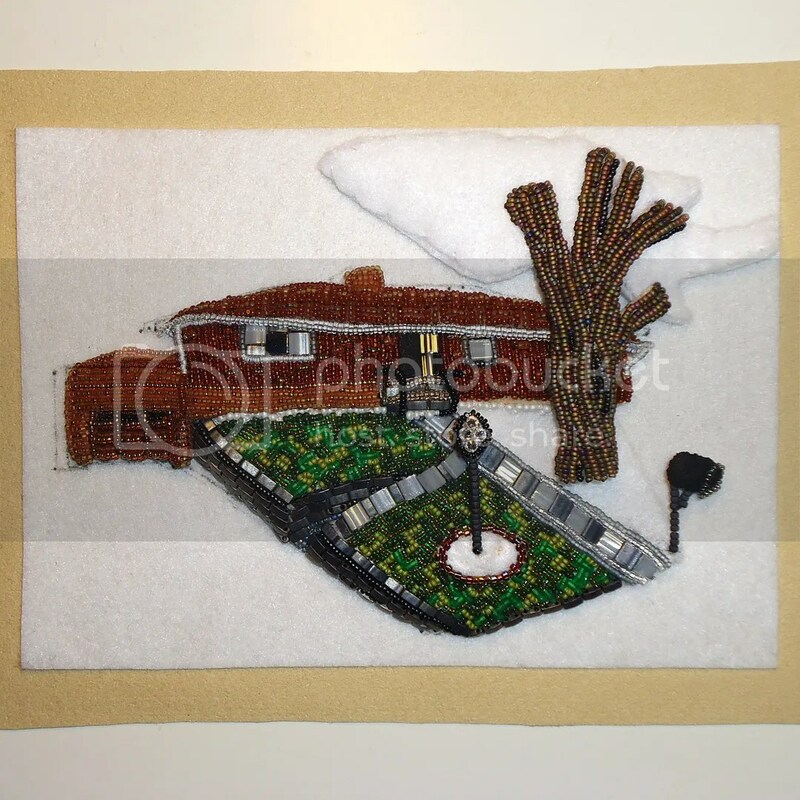 When I finished the lawn, I peyote-stitched tiny bits of greenery around the yard light. 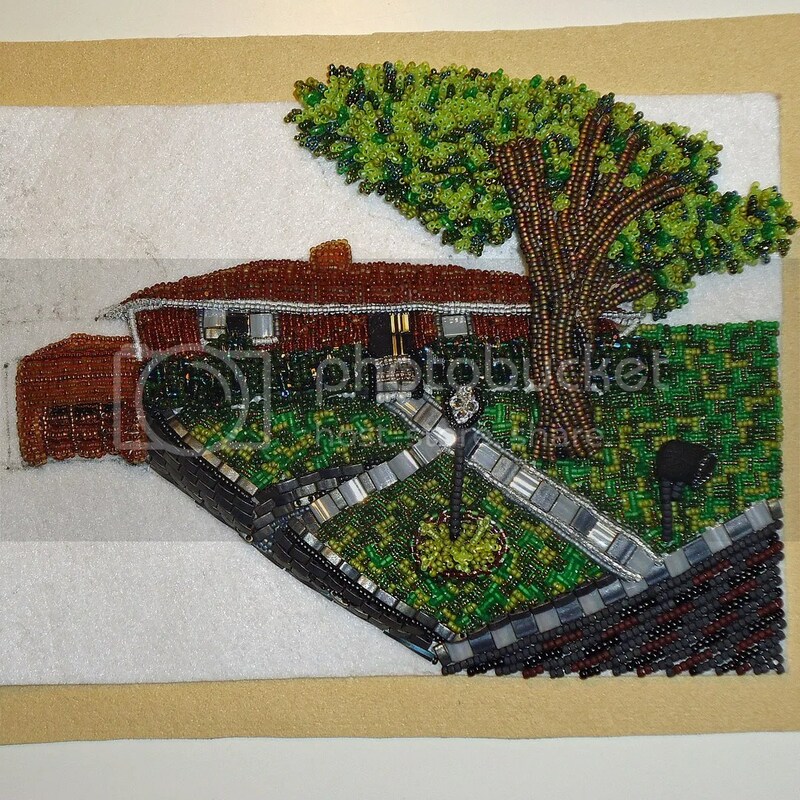 And, I added bead -embroidered shrubs or yews along the front of the house.. How do you think it looks so far? 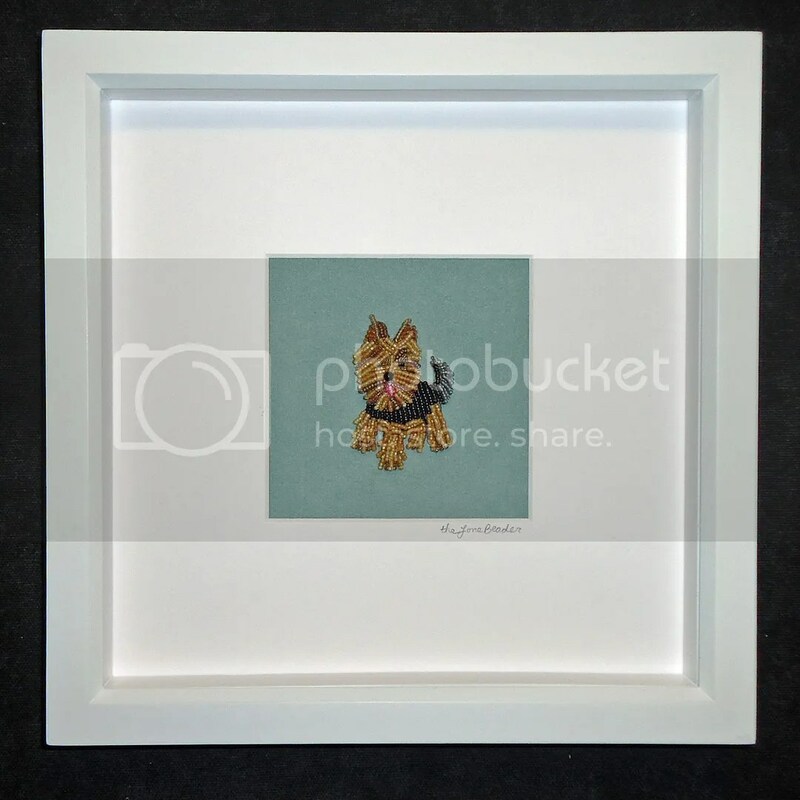 Custom Framed Beaded Pet Portraits on Etsy! 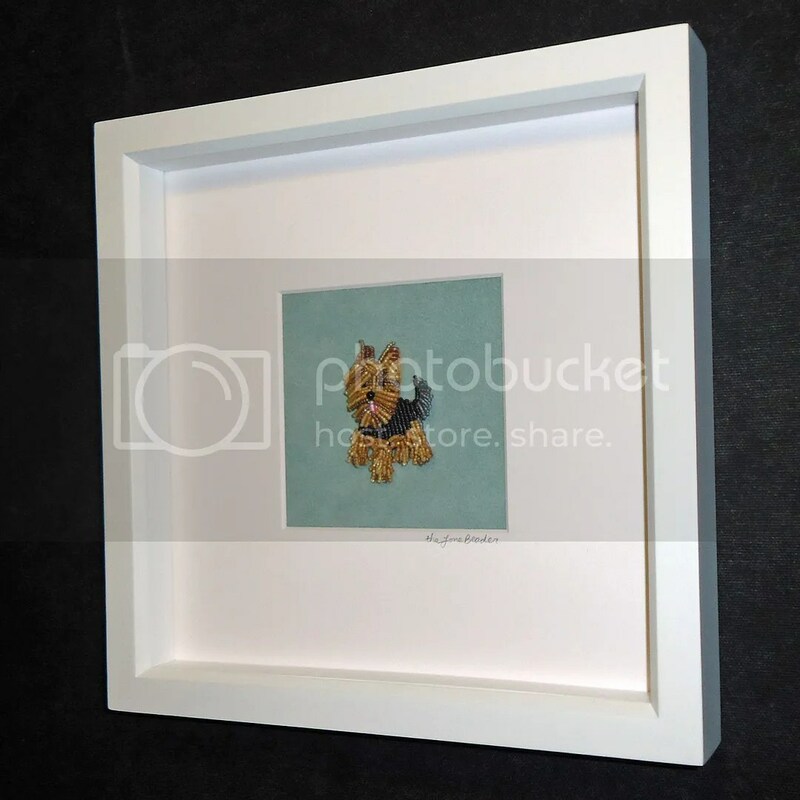 Dear friends, I am thrilled to announce that I will now be offering custom framed beaded pet portraits in my Etsy shop! 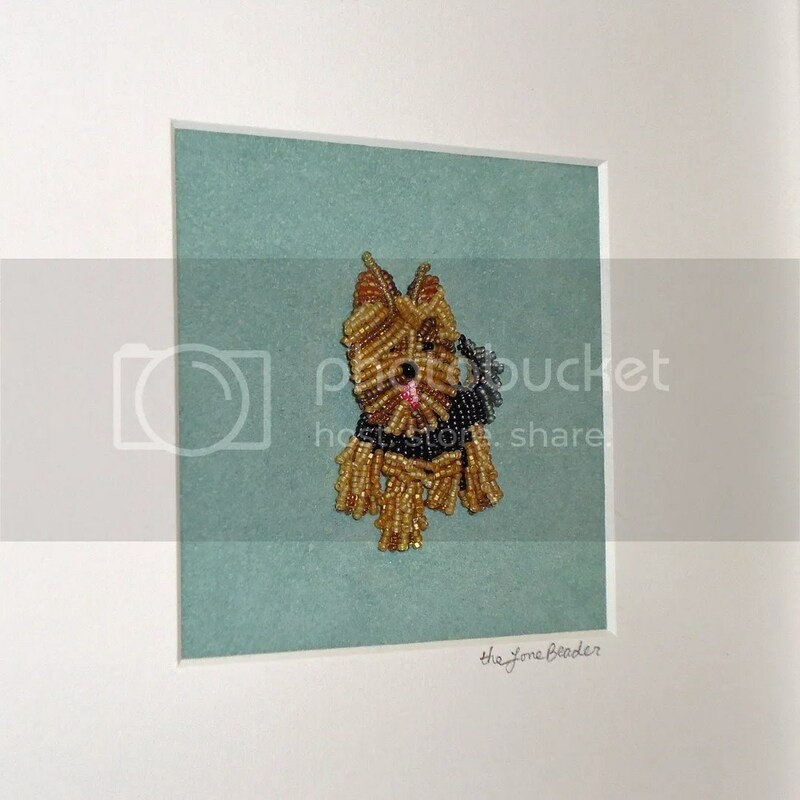 Here is the first piece I have created – a bead-embroidered Yorkshire Terrier portrait. This little dog was created with tiny Japanese glass seed beads. 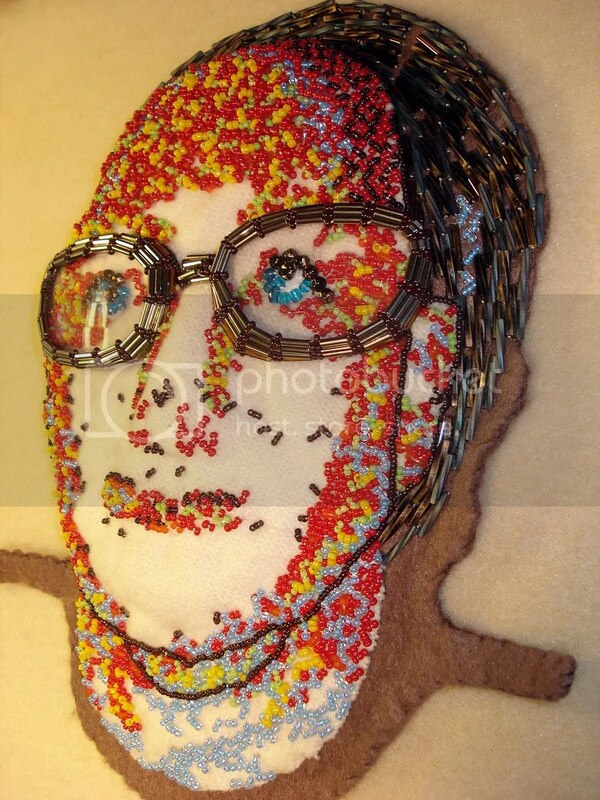 It was hand-stitched using needle & thread. 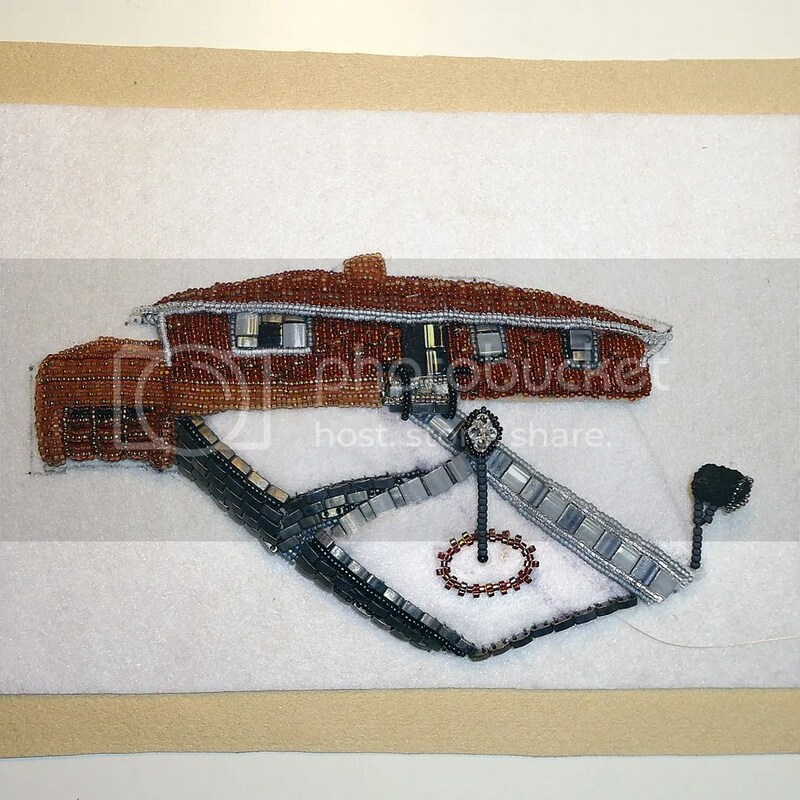 Beadwork was then sewn to an Ultrasuede background which was mounted in an 8″ x 8″ white shadowbox frame. This piece is currently available and ready to ship. 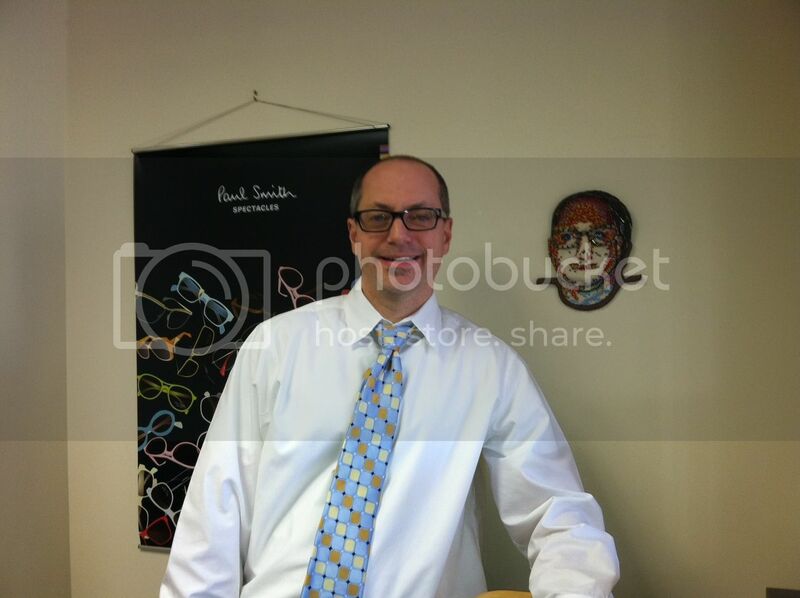 Please click the photos for more details. Truly a unique keepsake which will be passed down for generations to come! 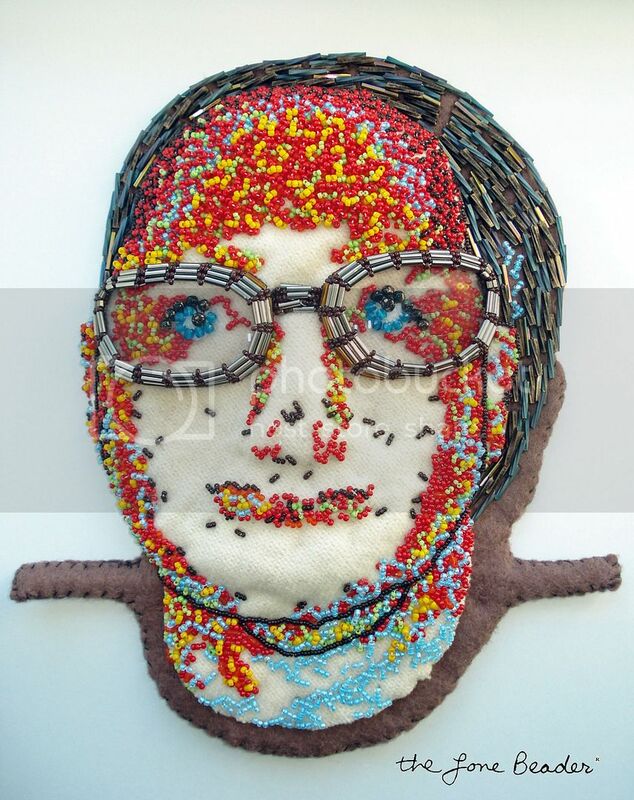 Beadwork on Display at Central Square Eye Care! In addition to doing beadwork, I have also begun writing a new bead embroidery tutorial which will contain step-by-step instructions on how to make one of my beaded dog pins. I hope to release it later this month! 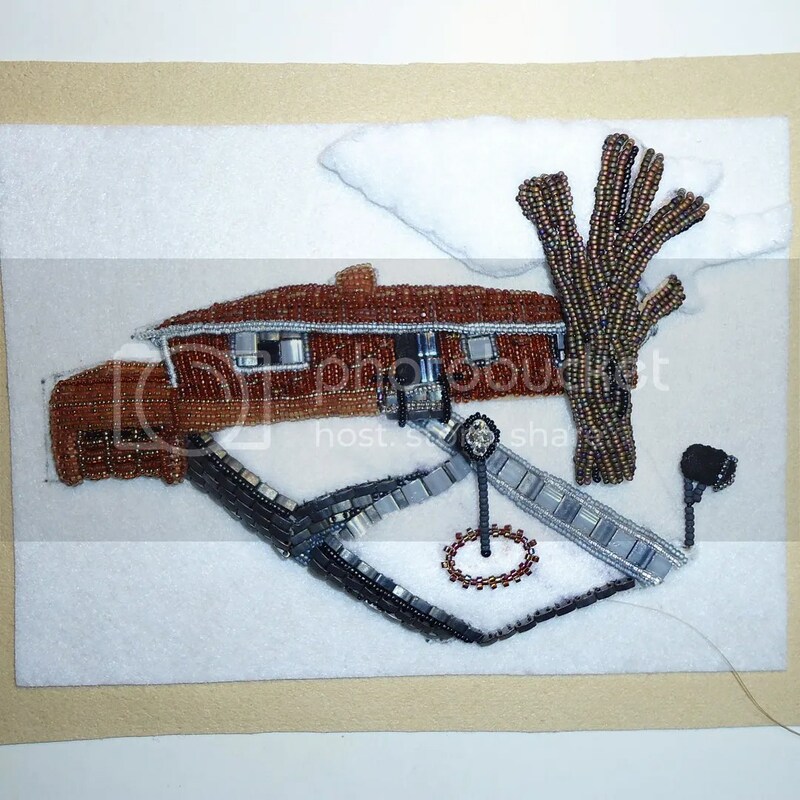 And, to those who may be interested, my beaded Radio City Music Hall painting is now listed for sale in my Etsy shop. That’s the news for now. 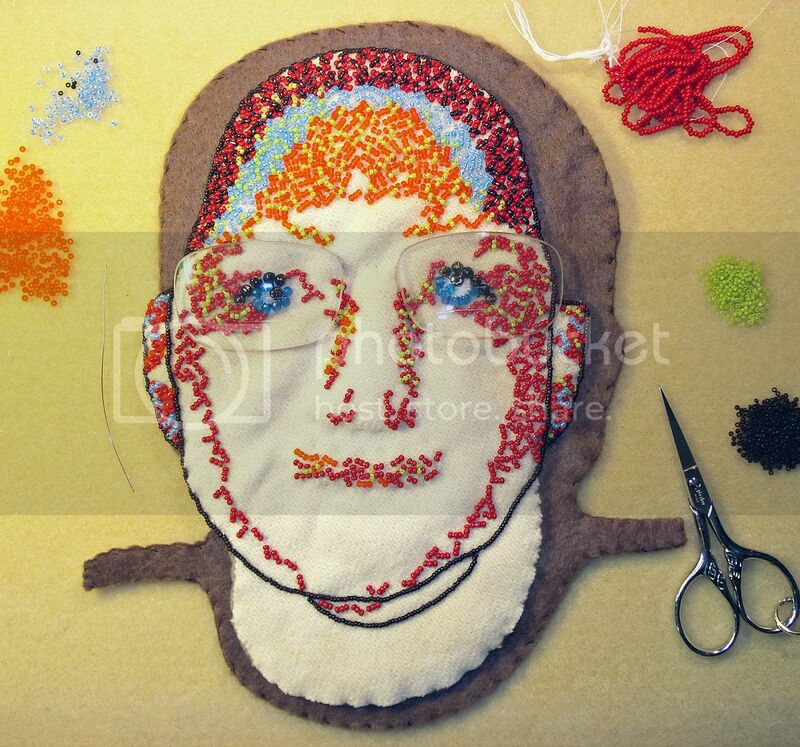 Back to beading! This week, I’ve been busy beading. 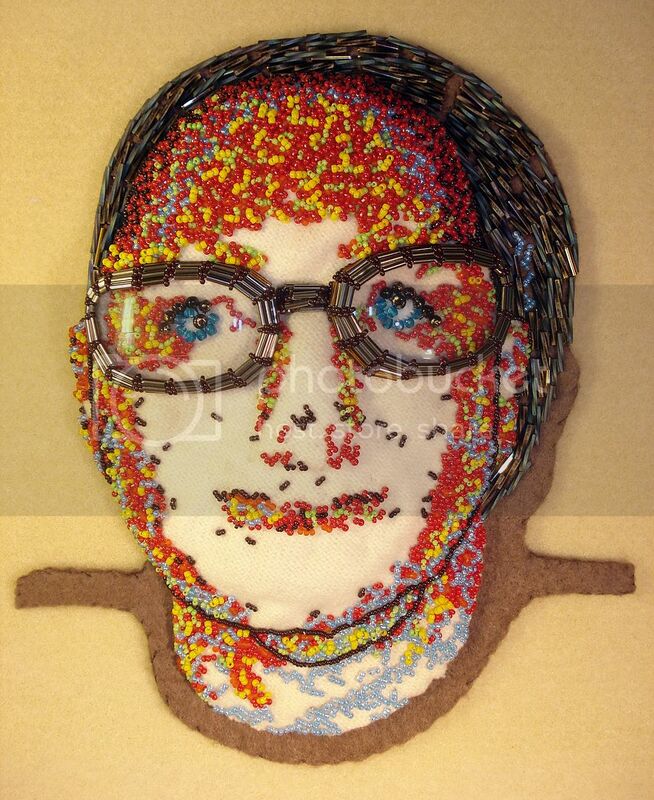 I worked on my beaded portrait a little more. 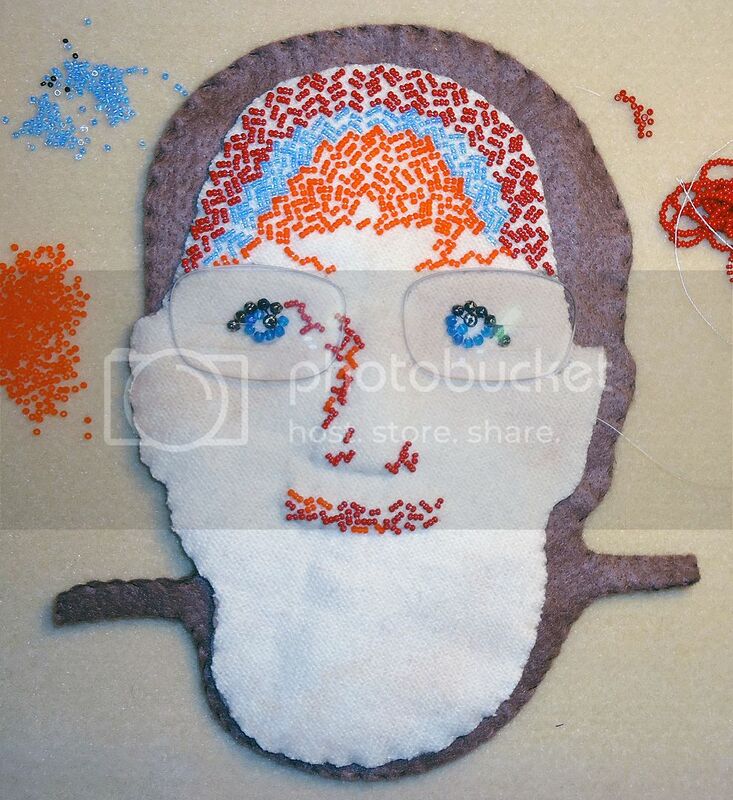 Using the lazy-stitch technique, I stitched red, orange, and blue seed beads onto the forehead, nose, and lips. I’m not sure it looks like my original drawing yet, but I do plan to layer more colors over each other as I continue to bead.. How do you think it looks so far?